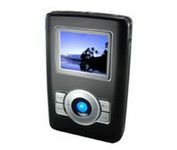 The MH-210 is the ultimate portable media player, being one of the smallest MP3/Video Players on the market today with a 20GB hard drive. It also plays videos flawlessly and displays photos and text files on a 1.8 full-color TFT screen for convenient viewing anytime, anywhere. In addition, the MH-210 can also record from various sources, including radio, line-in audio devices, and a built-in microphone. The 20GB hard drive stores up to 5000 songs, over 60 hours of video, and tens of thousands of photos. Plus, an intuitive and attractive interface, internal playlist management, and fast Hi-Speed USB 2.0 transfers make the MH-210 the portable media player to own.